We established the BigCi Environmental Award in 2014, because BigCi is located on the edge of the Wollemi National Park in the UNESCO World Heritage-listed Greater Blue Mountains. BigCi is an independent, artist run, micro-artist residency program with the focus on supporting practicing artists by facilitating their projects. In addition to the artist residency program, BigCi is available for a variety of events, performances, workshops, installations and exhibitions. Because of our location within the UNESCO World Heritage-listed Greater Blue Mountains and the knowledge base of our team, many of our residents are particularly interested in projects that explore environmental or ecological issues. To further strengthen our connection to nature and our responsibility to its preservation, we established BigCi Environmental Award. This year, we will be running it for the fourth time, and it is going from strength to strength, generating a wide international following. Last year, for example, we received submissions from 48 countries. Karen Power (Ireland), an electroacoustic composer that specialises in using environmental and every day sounds as source material for her compositions. Lisa Hirmer (Canada), an artist working with a multi-faceted projects that focus on the ideas of biodiversity. In 2017, we are planning again to offer 2 Awards. Each winner will receive 4 weeks artist residency at BigCi, $2000 each spending money and up to $2000 ArtFlight subsidy that will be shared between 2 winners for their travel expenses. The winning artists will exhibit at BigCi Open Day and will participate in a cultural programme. The Award is open to artists from various fields such as visual art, installation, multimedia, performance, literature, music, film-making and curating. 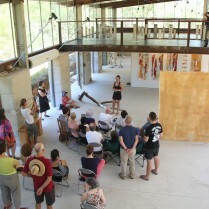 Images: Visitors at BigCi Open Day, Art Shed, Lisa Hirmer (Canada), co-winner of the BigCi Environmental Award and Karen Power (Ireland), co-winner of the BigCi Environmental Award. Rae Bolotin is a sculptor and an artistic director of the BigCi – Bilpin international ground for Creative Initiatives. BigCi is an independent, artist run, not for profit micro artist residency program with a focus on supporting practicing artists by facilitating their projects. Painters, sculptors, multimedia artists, performance artists, writers, musicians, filmmakers and other creative souls are invited to apply for the residency.